She says it isn't loaded as she passes it to you, but it feels heavy, the metal still warm from her hand. You could open the chamber and check, but that would violate some rule of trust between you. You have to believe her, it isn't loaded. The neighbor kid thought the gun wasn't loaded when he took it out to show his friend, just that little thing, and the shot was heard for years after, the story whispered from kid to kid through two generations. Your uncle must have thought the shotgun wasn't loaded when he leaned it against the fence before climbing over, but we'll never know, his mouth is closed forever. So it isn't loaded. So you trust her, and put your finger on the trigger. 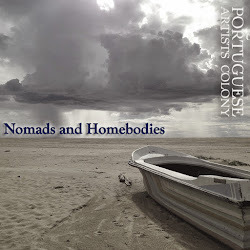 Join Portuguese Artists Colony on January 22 to see what happens next. Seth Harwood received an MFA in fiction from the Iowa Writers’ Workshop and went on to build a large fan base for his first novel, Jack Wakes Up, by first serializing it as a free audiobook. Across iTunes and sethharwood.com, his work has been downloaded over one million times. His second novel, Young Junius, is billed as "The Wire meets Cambridge, MA in 1987″ and was picked by George Pelecanos as one of his best books of 2010. Seth currently lives in San Francisco where he teaches English and creative writing at Stanford and the City College of San Francisco. Brittany Perham is the author of The Curiosities (Parlor Press 2012). Her recent work may be found in Southern Poetry Review, TriQuarterly, Lo-Ball, Linebreak, and elsewhere. She is a Jones Lecturer in poetry at Stanford University, where she held the Wallace Stegner Fellowship from 2009-2011. She is a member of the word/music project Nonstop Beautiful Ladies and she lives in San Francisco. Steven Paul Lansky will return with a long-distance reading of his winning piece from December's live writing, inspired by the prompt, "She saw Jesus." 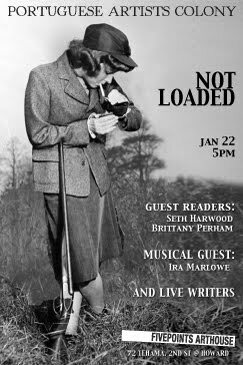 Live music from "Oakland's sweet little secret," Ira Marlowe.